Acting Permanent Representative of the United States Jonathan Cohen addresses the United Nations Security Council, at U.N. headquarters, Jan. 22, 2019. The United States said Tuesday an international conference next month to promote peace and stability in the Middle East is not aimed at demonizing Iran. U.S. deputy ambassador Jonathan Cohen told the Security Council that the conference in Warsaw on Feb. 13-14 sponsored by the United States and Poland is also not aimed at discussing the merits of the 2015 Iran nuclear deal known as the JCPOA, which U.S. President Donald Trump withdrew from in 2018. Cohen's comments followed a tweet by Iran's Foreign Minister Mohammad Javad Zarif who denounced the upcoming conference as America's anti-Iran "circus." Poland's foreign minister Jacek Czaputowicz said in remarks published Monday that Iran wasn't invited and Russia would not attend. FILE - Iranian Foreign Minister Javad Zarif attends the geopolitical discussion event in New Delhi, Jan. 8, 2019. 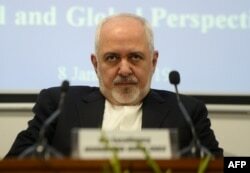 Zarif protested to Poland for its hosting with the U.S. a summit focused on the Mideast and especially Iran. Cohen called the ministerial meeting a brainstorming session to "develop the outline of a stronger security architecture" in the Mideast with sessions on the humanitarian crises in Syria and Yemen, missile development, extremism and cybersecurity. "It's also important to state clearly what this ministerial is not: It is not a forum to re-litigate the merits of the JCPOA. While we've made our concerns with the JCPOA clear, we respect other states' decisions to support it," he said. "It is also not a venue to demonize or attack Iran." Cohen said Secretary of State Mike Pompeo "has outlined a clear strategy to reach a new comprehensive deal with Iran built on the shared global understanding that Iran must cease its destabilizing activities." But the U.S. envoy said the conference will acknowledge the need for action against Iran's missile program, Iranian proxy Hezbollah's tunnels from Lebanon into Israel, and the "unacceptably provocative act by the Iranian and Syrian regimes" in launching a rocket from Syria at Israel over the weekend. Cohen said these activities, among others, are "drivers of instability in the Middle East, but the scope of the discussion will be much broader than any one country or set of issues." "As a testament to this, countries from around the world have been invited to participate," he said. Cohen said there will be "a dynamic discussion and collaborative thinking with the goal of contributing to a more peaceful, stable and prosperous Middle East," adding that this would be "a more productive approach" than the Security Council's monthly Mideast meetings focusing on the Israeli-Palestinian conflict.